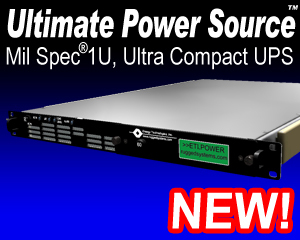 The field proven Rugged Systems™ Power Distribution Unit (PDU) line is ideally suited for military, industrial and telecommunications applications requiring a rugged rack, vehicular or field deployable, high reliability, compact sizeand light weight design. The heavy-duty chassis occupies only 2U (3.5”) ofrack space while controlling up to 7000 VA of power via fifteen (15) circuitbreakercontrols. Therounded metal corners aid in safe handling. Internally, all major components are well secured and electricallyinsulated to prevent damage due to shock and vibration. All controlsand protective devices are brought to the front panel. Further, all front panel devices are recessed with critical switches orbreakers guarded to prevent damage or accidental operation. The three pole input breaker provides overload and short circuit protection for the whole unit. The PDU allows control ofthe individual output circuits. The optional Emergency Power Off (EPO) function can remotely open the input circuit breaker. Each load is controlled and protected by a 100 G shock rated circuit breakers avoiding accidentaloperation due to shock or vibration. An optional elapsed time hour meteris available to track therack equipment operation for maintenance. Therear panel provides locking connectors for the input power and output power. The combination MS input connector and input EMI/RFI filter provides suppression of conducted EMI. The transient surge suppression helps further protect the connected equipment. Overall, the Rugged Power product line is uniquely qualified for critical shipboard,vehicle, airborne or land based systems combining advanced modular design features with highly reliable construction.